“Zero Waste” does not have to apply only to individuals who literally produce no waste. Practicing zero waste can simply mean adopting a lifestyle in support of a circular economy that makes the most sustainable use out of our resources. 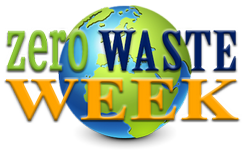 For more on definitions of zero waste, visit the Zero Waste International Alliance: https://zwia.org/standards/zw-definition/. plastic bags (grocery bags, produce bags, etc.) The “working life” of a plastic bag is estimated to be about 15 minutes, but it lasts forever in the landfill. Invest in some reusable bags, or make use of items you already own, like old totes, T-shirts, scarves, and even suitcases! plastic bottles (water, soda). Bring your own container instead! plastic straws. Just say no! Or bring your own resusable. plastic-lined cups (coffee). You guessed it: bring your own. Refuse/reduce: Imagine the entire life cycle of a product before you let it enter your home by asking a few questions: What was the environmental cost of its production (energy, resources, travel, etc.)? How much use will you get out of the product before it wears out or you don’t like it anymore? Will you have to spend more money, time, and resources as a result of buying this product? How will you dispose of the item, and how easy will it be? Reuse/Repair: Instead of buying something new, can you reuse something you already have, or purchase it secondhand? The less you participate in creating a demand for “virgin” products, the better. When something breaks or wears out, see if you can extend its life by getting it repaired. Recycle: Recyling is a crucial step for items that you have to buy new (avoiding plastic – especially #3-#7 altogether when possible). But for US citizens, we must be careful. Most of us with access to recycling have “single-stream” recycling, which means they will accept nearly anything we place in the bins and we don’t have to bother sorting our recycling into different materials. This means more of us are likely to recycle, but it also paints a misleading picture of how much we are diverting from landfill. Many items placed in the recycling stream become contaminated (by food, for example, or glass shards) or are not able to be sold to manufacturers due to low demand. Just because something can be recycled, doesn’t mean it will be. The cost of the recycling process is a big factor. Rot: If you are lucky enough to have curbside composting, take advantage of it! Similarly, find out if there’s a place you can take your compost to, whether it’s a city-organized site or just a small community of farmers or gardeners. Better yet, grow your own garden and use the compost yourself.